I have a favorite movie. An all-time favorite. Well, at least since 1992. It’s Howards End. A Merchant Ivory adaptation of an E. M. Forster novel, it stars Anthony Hopkins, Emma Thompson, Vanessa Redgrave, and Helena Bonham Carter, though I particularly like the portrayal of Leonard Bast by Samuel West. (He’s on the poster.) I also love the era and place: England, circa 1910. 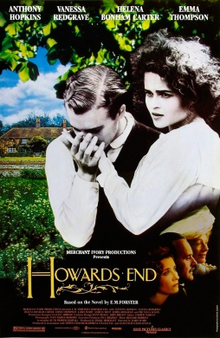 Howards End won three Academy Awards in 1993 from nine nominations. This movie isn’t for everyone. I have a coupon from a daughter. As a gift, she promises to watch the movie with me “without complaining.” I have yet to collect. Maybe you’ve never heard of it. Maybe you read the novel of class struggle in school. No matter. Here’s the secret to the film: It’s not about class struggle. It’s about forgiveness and redemption and unconditional love. And what happens because of them. It’s tragic. It’s devastating. People get in trouble and they pay for it dearly. It’s loaded flat with irony. And it is very, very funny. The awkward moments are perfect. Just watch for the scenes with the puppies and, later on, a staircase. If you haven’t seen the movie, it’s a bit of an investment both financially (unless your library has it) and intellectually. But it’s worth it if you like to watch love well and truthfully told.